Curious about what happens at a weigh station? Read all about them in our blog! A weigh station is a designated stop where the Department of Transportation (DOT) inspects the weight of a vehicle to ensure you are traveling with a safe load. Weigh stations are very important for all cars on the road, as overweight vehicles can cause major problems on a highway. In the U.S., the maximum weight of a truck with a full trailer is 80,000 pounds. 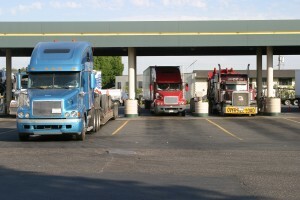 For new truckers who have yet to encounter their first trip to a weigh station, here are a few things you should know. Any commercial motor vehicle weighing over 10,000 pounds is required to stop at a weigh station, with a few exceptions. For example, if the driver has a PrePass or a weigh station bypass service, they may not be required to stop. Apps like Trucker Path allow truck drivers to check ahead to make sure a weigh station is open or closed, saving them valuable time while on a long haul. Along the highway, there are often green signs that say “weigh station” with a notice whether it is open or closed. If the station is open, the trucker must exit and enter the scales for the truck to be weighed. Many weigh stations have a rolling scales that allows a truck to roll past a certain area that has a scale. The truck must be verified to weigh under 80,000 pounds, and if it passes, it is cleared as safe to drive on the highway. However, the truck may be flagged for inspection by a DOT or state inspection officer for a variety of reasons. DOT officers or Federal Motor Carrier Safety Administration agents may decide to conduct a thorough equipment safety inspection to find issues with a truck, including flat tires, oil or anti-freeze leaks, brake malfunctions, cracks in wheels and rims, and more. This entry was posted on Sunday, January 14th, 2018 at 6:53 pm	and is filed under Road Travel, Trucking Industry. You can follow any responses to this entry through the RSS 2.0 feed. Both comments and pings are currently closed.